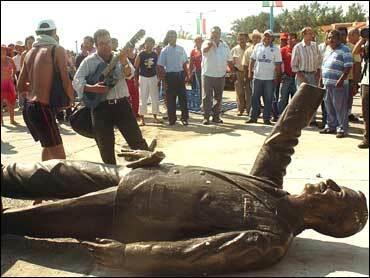 Opposition protesters have torn down a bronze statue of former Mexican President Vicente Fox, just hours after it was erected this morning. Workers put up the commemorative 10-foot statue before dawn in the city of Boca del Rio, in Veracruz state. But by midmorning a crowd of about 100 angry protesters began egging the statue, fastened a rope around its neck and pulled it to the ground. Many were members of the centrist Revolutionary Institutional Party, which governed Mexico for much of the 20th century until Fox (of the conservative National Action Party) won a presidential election in 2000. The statue's inauguration ceremony, scheduled for tomorrow, has been canceled. In recent days Fox has denied accusations of corruption during his government. Last week Fox gave interviews to various U.S. networks and was questioned about how he got various cars and properties during his time in office. The scene was reminiscent of the scene in Baghdad following the U.S. invasion of Iraq, where U.S. troops and members of the Iraqi National Congress pulled down a statue of Saddam Hussein opposite the Palestine Hotel.